Over the centuries, the Riviera on the two sides of the border has attracted poets like Percy B. Sherry, Lord Byron, WB Yeats and Ezra Pound and painters of renown. Today, as in the past, the border attracts refugees as well as the great and the good and this Diaspora has in turn created its own literature. One of the masters of recent Italian writings is the San Biagio della Cima, Imperia–born Francesco Biamonti. 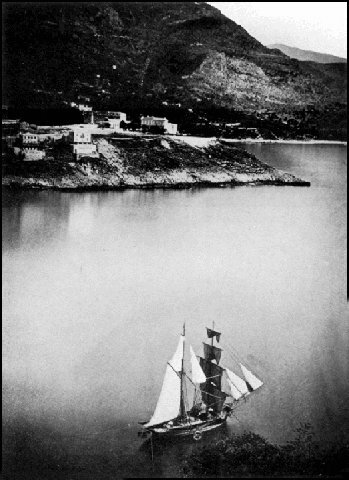 In his 1991 novel,’ Vento Largo’ he describes the life of a passeur, Vari Sabel, from a frontier Ligurian village who, through unmarked and dangerous pathways once used by shepherds, soldiers and smugglers of the past, brings desperate and stateless clandestine refugees through the Liguria border into Provence. Concealed, precipitous and rocky pathways into France made crossing the Italo-French frontier in the nineteenth century difficult. The nature of the rocky promontory on which Monaco was built, made it particularly inaccessible. In the first half of the nineteenth century, travellers from Sanremo to Marseilles used horse-drawn long wooden-seated tram-like carriages that carried about twenty passengers in a journey, continually interrupted by arbitrary customs inspections, which took days. The railway system adopted the same type of coach in a modified form when it was introduced on the Côte d’Azur in 1868. Prior to this, travellers could visit many cities and towns on the coast, particularly the Principality of Monaco, only by ship. Commerce, traders and artists travelled through mountain passes between Piemonte, Liguria and Provence. Local families like the Dorias, the Genoa Republic and the various Cardinal Princes of Genova jealously guarded and fought over these routes. Visitors to the Riviera hinterland are often surprised to come across masterpieces of medieval art in what are still today relatively inaccessible western Ligurian mountain towns. In Pigna you have a monumental altarpiece of St. Michael painted by Giovanni Canavesio a painter from Pinerolo, Piedmont in 1500. It has remained in St. Michael’s parish church until the present. (Apart from 1997 when the central panel was stolen, later recovered by the carabinieri in a provincial road in Como.) The artist was working in the west Liguria and Maritime Alps in 1482. The Pigna Predella is his last known signed work. Artists of this stature are the principal reason that Liguria and Piedmont painting styles dominate Monegasque art of the early Renaissance. The Principality of Monaco had a long tradition, as far back as the Renaissance, of encouraging Italian artists to work and live in Monaco. An important early Renaissance painter Louis Bréa, and to a lesser extent, his brother Antoine, were already seriously engaged in important commissions through 1500 and 1505 in the Principality. Louis Bréa’s Saint Nicolas altarpiece, in the Cathedral of Monaco painted around 1550 is the oldest old master painting of note in the Principality. This masterpiece, interestingly, shows the influence of contemporary Avignon and Catalonian schools with some traces of Flemish art. There is also a notable suggestion of the type of painting practiced in southern Germany; it is an interesting example of how such styles were so international at the time, with painters absorbing ideas from both Italian and Gothic art. Louis Brea (Nice c.1450 - Genoa c1523). Louis Bréa’s influence extended from Savona - where he collaborated in 1490 on important paintings with Vincenzo Foppa, a master of the post-Gothic style, to Genoa and Palazzo Bianco. Louis Grimaldi - a nobleman the then owner of Palazzo Bianco - probably commissioned Bréa to paint this altarpiece and other important works. 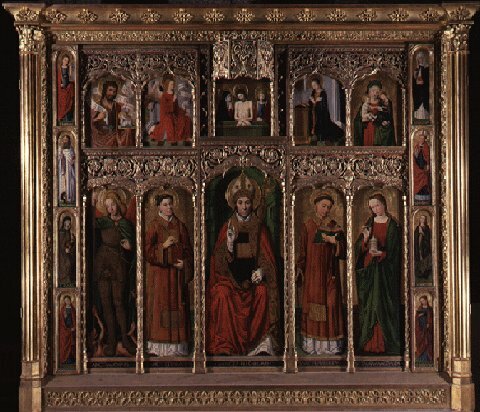 The altarpiece of Saint Nicolas - one of the rare extant works of art from before the French revolution that were not destroyed or dispersed - is the starting point for the history of Monegasque art. Stefano Grimaldi tutor of the future heir to the throne of Monaco, Onorato ler. converted the architectural style of the castle of Monaco from its original form as a heavily fortified medieval structure (and also its interior), closer to that of the palaces of contemporary Genoa nobility. Apart from the existing buildings that we know today, Peter Paul Rubens during his stay in Genoa made complete drawings of these same edifices that he subsequently published on his return to Antwerp. The close links which existed between Genoa and Monaco was the reason Genovese Renaissance painters - and in particular the frescos painters who worked for the Dukes of Grimaldi in Genoa - were called in to decorate the Prince's recently rebuilt palace. Lazzaro Calvi was one of the first contracted artists. Born in 1502, - he, according to a highly unreliable legend, died at the age of a hundred and five years - his style of painting was based on those of Luca Cambiaso and Pierin del Vaga. Interestingly, the latter had been one of Raphael's students. Del Vaga was commissioned create a series of fresco paintings at the palaces of Admiral Andrea Doria and other Genoa notable. As a result, he introduced his style - and indirectly, that of Raphael - to Ligurian and Monegasque art that continued through to the following centuries. The particular style of frescos painted by Del Vaga in Monaco - called grisaille, monochrome tints of grey - is still practised in present day Liguria. The flowers and the Grotesque animals that Pierin del Vaga painted over the arcades and in the medallions of the main courtyard of the Royal Palace of Monaco show the Raphael influence. These frescoes were a new interpretation, inspired by the Renaissance, of ancient Roman bas-relief sculpture. The classical Roman manner reappears not only in Raphael's paintings, but also in Mantegna and, of course, Michelangelo. The frescos on the Main courtyard of the Princely Palace of Monaco's façade, ‘The Labours of Hercules’, have been also attributed to Luca Cambiaso of Genoa (1527-1585) an artist frequently employed by the Grimaldi family to work on their palace in Genoa. He may have collaborated around 1552 also, with Lazzaro Calvi. In the following centuries the frescos degraded seriously, though it is recorded that, in 1870, they were still visible at the time that an obscure artist, Philibert Florence, attempted their conservation. Crossing backward and forward across the border in the manner of their illustrious predecessors in the same period as Philibert Florence were the better known, Pierre-Auguste Renoir and Claude Monet. During December 1883, Renoir and Monet visited Bordighera and the Riviera on a two-week tour and remained enamoured of the landscape’s beauty, the splendours of the border area and its ecology. 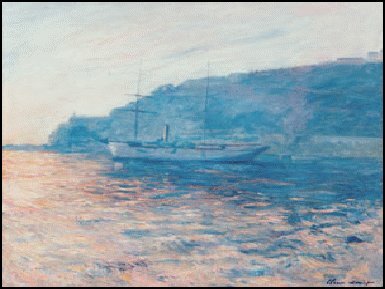 Monet’s large 1884 output on the Riviera creates joy for residents of the Côte d'Azur, and a shock of pleasure when we unexpectedly encounter the paintings he completed in this region on our travels to Rome, the Musée Marmottan or the New York Metropolitan museum. Today the Tunisian boat people mass on the Ventimiglia border encouraged by modern-day passeurs who, for 200 Euros, take them through S.Luigi and Sospel on their mopeds. Will the dream of these new migrants of reaching the promised land of France be a stimulus and an incubator for the future art, literature and creativity of the Riviera?